Chronic wounds that don’t heal within three months present ongoing problems. Learn the risks and treatments for the three most common types. If you have a sore or wound that lingers over a period of weeks or months, it’s time to see your doctor. A chronic wound can lead to dangerous complications, but there are a number of treatment options to help avoid more serious problems. Chronic wounds, by definition, are sores that don’t heal within about three months. They can start small, as a pimple or a scratch. They might scab over again and again, but they don’t get better. 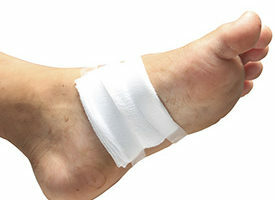 If you have a sore or wound that follows this pattern, it’s a red flag that you should consult a physician to start a care plan, says Cleveland Clinic Wound Healing Medical Director, Christi Cavaliere, MD. While cancer can sometimes present as a chronic wound, chronic wounds typically fall into three main categories: diabetic ulcers, venous leg ulcers and pressure ulcers. Neuropathy: Loss of feeling in the feet makes it more likely that small cuts or trauma will go unnoticed, leaving wounds at risk for infection. Poor blood flow: Insufficient blood flow to the legs makes it harder for wounds to heal. Infection: Compromised ability to fight infection puts diabetics at greater risk for wounds that progressively worsen and may require amputation. Nutrition: Adequate protein intake and proper hydration is vital to all wound healing. Diabetic patients must also eat foods that help maintain glucose-level control. Eating complex carbohydrates, such as whole grains and vegetables, can help, she says. Venous leg ulcers account for a high percentage of leg wounds. Frequently, they stem from uncontrolled swelling in the legs and tend to weep because the legs are overfilled with fluid. They can also be painful and itchy. Blood doesn’t flow back up the legs well with these wounds, so the legs often feel heavy. The skin around the wound can harden and become discolored. Venous leg ulcers tend to recur and maintenance usually requires regular compression therapy such as compression stockings. Any leg swelling should be evaluated by a physician because many conditions cause swelling- some, such as blood clots, require more extensive evaluation or treatment. Compression garments: ACE bandages or compression stockings help prevent fluid from pooling in the legs and can stave off future leg ulcers. Vascular intervention: A vascular surgeon can help identify what underlying cause is contributing to leg ulcers. These wounds occur when pressure is constantly exerted on body tissue over a period of time. They can appear sometimes in as short a time as a few hours, Dr. Cavaliere says. The constant pressure compresses vessels that carry blood to keep the tissue alive, opening the door for injury. Bed-ridden or wheelchair-bound patients are at highest risk for pressure ulcers, including those with spinal cord injuries or those with some form of dementia. Sores are most likely to develop on the tail bone, sacral bone or heels. “Unrelieved pressure can lead to full-thickness tissue death, leaving large wounds and, potentially, exposed bone,” Dr. Cavaliere says. The No. 1 treatment for pressure ulcers is simply removing the pressure. Turning or moving the body can prevent injury. Some patients may also require special mattresses or additional cushioning to protect bones. Untreated ulcers can develop into infections so severe that hospitalization and intravenous antibiotics are required.